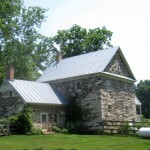 By the 1760’s there was a well established way in the trek from Berks County, Pennsylvania to Frederick County, Maryland. The route went overland to Marietta, PA, where it crossed the Susquehanna, River, thence to York, PA. From there it followed the stage coach route along the Monancacy River that practically cut through the center of Maryland to the new town of Frederick. Before reaching the town, the Isenbergs turned east. The land that Gabriel Eisenberg was interested in was on the way to the more populated eastern areas of Lord Baltimore’s colony. Even after a hundred years, until Lord Baltimore opened the western and northern areas, the populated areas were mainly along the coastal districts. His offer of land, less taxation, freedom of religion and less Indian aggression caused many of the Germans living in Penn’s Colony to leave mainly of the Lutheran and the Reformed faith, 2/3 Lutheran and 1/3 Reformed. Nearly always they worshipped together. This is taken from the Charles H. Glatfelter’s book, “Pastors and People”. He also notes that the Reformed people were greatly influenced by the Brethren in their midst, many going over to that faith. Here, we would like to reiterate that we have no record of any of the other Eisenbergs who were with Gabriel in Berks County, PA making the trip with him to Maryland, with of course, the exception of his immediate family. We do though, have records that the Haspelhorns, Sweadners/Schwedners, the Smouses, etc went to Maryland in the 1760’s and settled in the same area as Gabriel. The land that Gabriel Eisenberg sought to buy was known as Bare (Bear) Garden. He finally got possession in 1769. The following extracts are from records found in the Frederick Court House. The name appears first as Gabriel Eisingbark. He bought of Edward Diggs (son of the deceased John Diggs) of St. Mary’s County a tract of land of 568 acres on January 18, 1769. He paid 512 pounds, 10 shillings and 10 pence. The name was also spelled in the same deed Eisingburgh. The tract was called Bear Garden and was paid for as follows: cash 125 pounds, 12 shillings, 0 pence half penny by John Sweden or Sinedinger (to whom Gabriel sold par of the land); cash 314 pounds, 12 shillings, 9 pence, half penny on account of Nicholas Strasburg’s bond; cash 118 pounds, 6 shillings and 5 pence. Gabriel’s wife appears as Mary Eve Eisenbark. His signature was spelled Gabriel Eisenbarg. (Liber M. pages 129, 130) In the same year, Gabriel Eisenbark sold or mortgaged another part of “Baugarten” – 232 acres for the sum of 230 pounds, to Henry Crowell or Crawl. In 1773 the mortgage was satisfied by Crowell on March 20. This left Gabriel with 186 acres, more or less. From then until his death in 1801, Gabriel was involved in land transactions, not only buying and selling, but also in being an executor for the estates of his friends. This occurred, for instance, in the sale of Justice’s Delight to John Clemson. He and Justice’s son John were designated as executors of John Justice’s will. However, before the will could be executed, the son died, leaving Gabriel as the sole executor. This land, Justice’s Delight, was near Bear Garden. 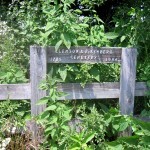 A small strip of land called William’s Neglect separated Bear Garden from Justice’s land. The exact deeds for the buying and selling of the land tracts cam be found in the Hall of Records, Annapolis, MD. In 1801 at Gabriel’s death , the only land that he owned was sold to Peter Saum by Nicholas Eisenberg, his son and executor. The land was near Union Bridge and east of Clemson land. To go back a little, after Eve’s death in 1785, Gabriel married Margaret, whom we believe to be his brother Simon’s widow, this was cal 1791. About this time John Clemson became interested in Bear Garden and in 1794 Gabriel sold his Bear Garden land to Clemson. This became final in 1799. Clemson also bought all the land surrounding this until he had over 1000 acres. This areas became known as Clemmont. On the William’s Neglect land adjoining Bear Garden, Clemson built the Clemson mansion. On the Bear Garden tract there was (and is) an old stone house that Gabriel probably built. John Clemson lived there while the mansion was being built by slave labor. 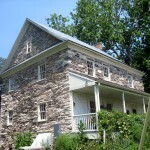 This old stone house had long been under observation by those interested in historic houses. 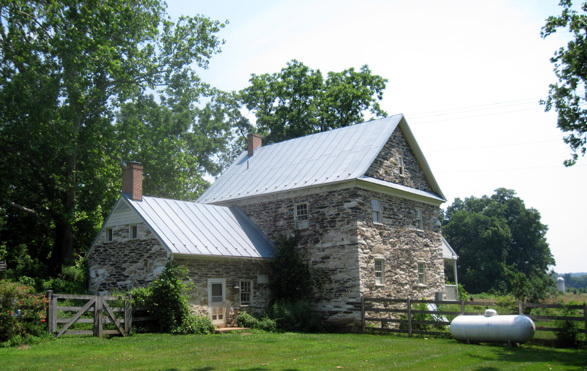 The fact that this house was typical of early Pennsylvania German houses rather than of old Maryland settlers, caused much speculation as to who had built it. The following map (on page 29 of the Bahney book) shows Bear Garden – 568 acres – as it was when Gabriel Eisenberg bought the land from Edward Diggs. The map also shows the land near Bear Garden that Clemson bought and the location of the old stone house and the Clemson mansion. Note the old family cemetery (now known as the Clemson Family Cemetery) where Gabriel and Maria Eva are buried. 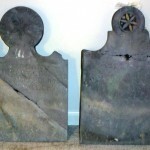 Eve’s tombstone shows her death year as 1785. Johannis Sweadner, who had come from Berks County, PA, at about the same time as Gabriel, is also buried there, as is Heinrich Schmaus (Henry Smouse), the father of the three girls who married Eisenberg men and who had bee in Greenwich Township, Berks County with Gabriel. 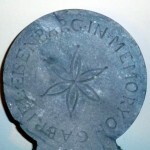 The earliest Clemson grave seems to be the marker for a child Elizabeth Clemson, b. 1796, d. 1797. The map was drawn by Joseph Urner from data furnished by Dr. H. Hanford Hopkins in 1967. 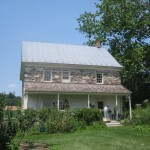 Dr. Hopkins is an authority on Maryland and pre-Revolutionary houses and other historic houses.. It was not until we were in touch with him that he knew that the Diggs land had an owner before John Clemson. The following is a letter from Dr. Hopkins about the old stone house. 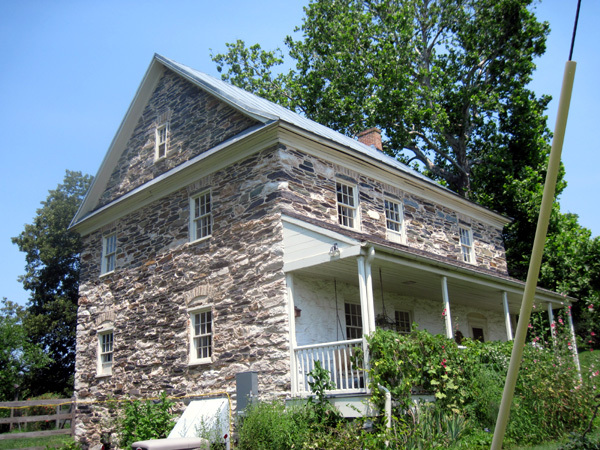 “This is an early rubble stone two story house, almost square plus a stone one story rear wing behind right rear. Entrance is off center to right with window about over shed roof of porch which may be later and which extends full width of house front. Deep gable roof (less 90 degrees between roof planes at right) is also stone – has small attic windows at each end and above a shallow pent roof resting on main roof cornice extended across ends. The roof overhand of a foot or more at gables puts the barge (like a wide molding) at edge of pent and lower edge of main roof is “kicked” slightly front of rear on wing roof as well. Th small chimneys at ends of roof are later and would have been larger originally. They are probably contemporary with the 19th century tin roof with standing seams. Stone wall of porch is white washed (sometimes this was plastered or painted white for decoration and to let reflected light into porch windows). The stones for Gabriel and Maria Eva Eisenberg were in bad condition when Don Berkebile first saw them. They became known to us when Jacob M. Holdcraft authored tow volumes of “Names In Stone – 75,000 Cemetery Inscriptions from Frederick County, Maryland”. Don was the first member of our family to locate the cemetery and he is the one who placed new stones with a brass underplate for the old ones. All of us are indebted to him for this. There are a few more land transactions connected with the family that we would like to note. These two transactions we believe might have been of Nicholas Isenberg who is listed in the 1790 census and who with his wife Elizabeth and family moved to Virginia before 1800 and finally settled in Tennessee. Then on Dec 29 1794, one Nicholas Isenberg bought land from Dudley and Ann Diggs. (Liber 13, folio 3) This transaction we feel to be that of Nicholas Isenberg, son of Gabriel Isenberg who is in both the 1790 and 1800 census. The above transaction, we believe to be between Gabriel Isenberg and his oldest son John George Isenberg. It was about this time that we think Gabriel Isenberg left Bear Garden and moved some miles east to the land he owned, part of a tract called “Bone of Contention”, close to Union Bridge and the present McKinstrey mill. At that time all of these transactions were in Frederick County, but now some of this land lies in Carroll County, which came into existence in the 1800’s when Frederick County was divided. Sam’s (Saum) Creek divides the two counties. In the records of the Evangelical Lutheran Church, Frederick County, MD, by the minister Samuel Schwerdfeger, there was a child Maria Eva Eisenberger born 1765, bap 1766, father and mother Gabriel and Maria Eva Eisenberger. There were no sponsors. It is assumed that there being no local minister at this time and the child being in poor health (she died later that year), that this is the reason for the baptism taking place in the Lutheran church since the Isenbergs were known to belong to the Reformed faith. In the Frederick Reformed Church, Rev William Otterbein had left in 1765 for York, PA and the new minister, Rev. Charles Lange, had not yet arrived. 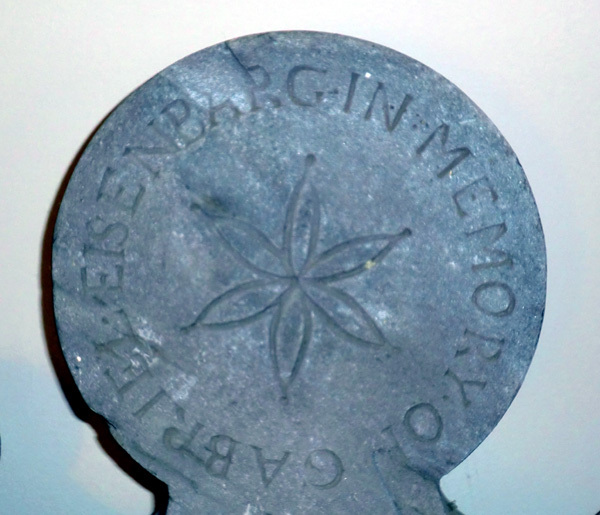 As you will remember we do not have baptismal records for Susanna, Catharina, and Enoch Isenberg, other children of Gabriel and Maria Eva Eisenberger born in Greenwich Township, Berks County, PA. It seems evident that they were baptized by itinerant ministers and so do not appear in church records. 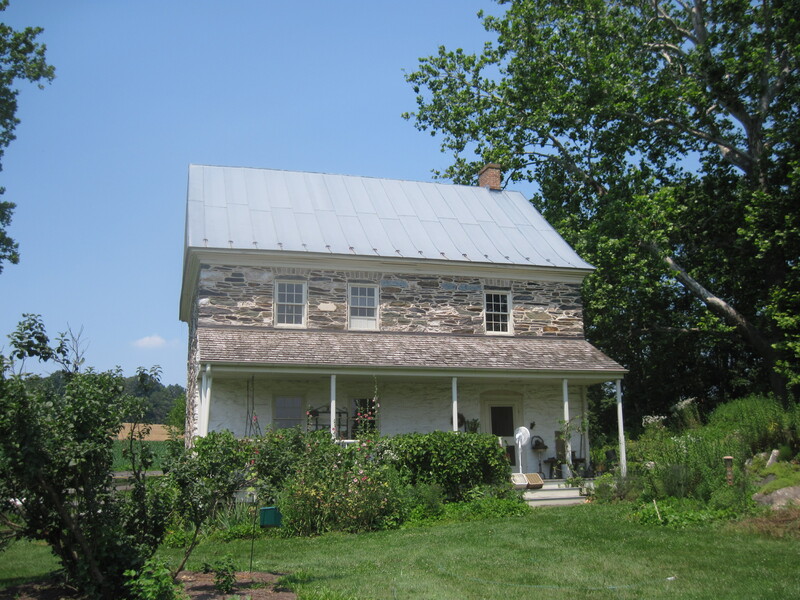 During the thirty some years that the Isenbergs lived in Frederick County, Maryland, many changes were taking place in the family life and in the New World. By the time that Gabriel acquired Bear Garden, John George, known as John, the oldest son, was 22 years of age. Jacob, the second son, was 18 years old. His youngest son, Enoch, was just 8 years old. The young generation was indeed growing up. At this time in history of our country there was widespread agitation and dissatisfaction emerging against the parent country, England. Also, unfortunately for those living in Maryland during this time, the Maryland colonial government was falling to pieces and Governor Eden in effect had abdicated his office. It became necessary to organize another government. This took the form of a committee known as the “Committee of Observation”. This Committee of Observation exercised all the functions of government during the turbulent and disorderly times from the date of its organization to the formation of the State Government in 1777. It executed the laws and tried and decided cases. One of this group’s acts was to announce that all eligible men were to enroll and be instructed in the use of arms pending the foreseeable war. Many German settlers were forbidden by their religious principles to take up weapons, but most were sympathetic with the Patriots rather than the English. At this first meeting of this Committee following it’s inception members of the Dunker and Mennonite faiths appeared before the Committee stating their cause and saying that they were willing to give money in place of military service, the amount to be decided by the Committee. This was taken under advisement to be decided by the time of the next meeting. Evidently, Gabriel Isenberg with his family, although of the Reformed faith, sided with the above group. At its second meeting, the Committee decided “that it is reasonable that every person who enjoys the benefit of their religion and the protection of the laws should contribute either money or military service.” This is taken from “History of Frederick County, Maryland” by T.J.C. Williams, Vol. 1, 1900, starting on page 84. It is not exactly understandable why this should be called a fine in the light of what we understand a fine to be in our time. A little further research found that the old use of the word was “a sum paid by way of compensation”. This makes sense the non-enrollers had definitely volunteered to pay for not participating in the military service. Another question arose as to why Jacob paid more than the others. The only conclusion that we could come up with was that he was not married while John and Gabriel (this being Gabriel, Jr.) were. Gabriel Sr. being past 50 years of age, was not eligible for service. The Michael Isenberger here shown is unknown. We have no record of him other than this one. So the war passed and the Isenbergs were among the first citizens of the newly formed United States of America. Political parties were in the making and there emerged two parties: The Federalists and the Democrat Republicans. In the official poll of the Presidential Elections 1796, page 291, Peter Isenburgh is listed as a D.R. Since John Adams was elected in 1796 and is listed as a F. it looks as though our Peter’s vote was on the losing side. Normal family living brought marriages, births, and deaths to the Isenberg family living in Maryland. Rev William Otterbein, who had been the minister of Frederick Reformed Church for many years (whom the Isenbergs undoubtedly knew), and other Reformed pastors conducted five “Pipe Creek Conferences” between 1774-1776 to encourage small groups or classes, within established Reformed congregations, to cultivate the intense personal religious life. This is taken from Glatfelter’s “Pastors and People”. It would seem evident that at least Gabriel and Maria Eva and possibly some of their children attended these sessions. Also of note is the fact that Thomas Schley had come to the Reformed Church of Frederick as a teacher. He was born in 1712 at Mertzheim in Germany and came to the New World by way of Annapolis, Maryland, in 1735 with a group of about 100 persons. He not only taught in the Frederick church, but went out into the nearby county churches. This enabled the younger Isenberg generation to be schooled under him. In reading about this part of his life, it appears that the Brethren children were also included in his classes. Rev Michael Schlatter, on e of the best known early Reformed ministers says of him . . .” one of the best school masters I have met in America. He also sang and read the Word of God and had sermons on every Lord’s Day”. This was found in William’s History of Frederick County, Vol. 1, page 6. In 1778 Frederick County, Maryland, decreed that a license had to be secured in order to marry in Maryland. The following licenses were found in Court House in Frederick. We list first the children of Gabriel and Maria Eva Isenberg. Since the marriage records for John George (Born 1747) and his wife Eve, Mary and her husband Jacob Worman, Anna Philipina (born 1750) and her husband a Shively, and Gabriel (born 1755) and his wife Catharine, are unknown, these marriages were probably performed before it was necessary to get a license. The other child, Enoch (born 1762), who married Dorothea Smouse, was probably married either in Pennsylvania or Virginia where a license was not required. None of these marriage records were known when our 1900 book was published. Since the baptismal records of Berks County, PA and the above Frederick County, MD, records were found, we have a more definite picture of the Isenberg family in Maryland. While the children were growing up and marrying and establishing families of their own, the health of Gabriel and Maria Eva Isenberg was failing. Gabriel made the following will in 1782. Signed and sealed and pronounced to be the last will and testament of the said Gabriel Isonburg in the presence of us the subscribers who in his presence and the presence of each other have herewith set our hands and seals. Maria Eva (Eve, his wife) was deceased. A daughter Maria Eva died in infancy. The family the, in 1790, included Isenberg, Zollmans, Wormans, Shivelys, and Truveys. We have not researched the daughters of Gabriel Isenberg, Sr. We do have some facts about them that we will record, but from here on our information will be mainly about the men in the family – that is until we reach the actual descendants of Gabriel’s sons. In the 1790 census is the name of another Nicholas Isenberg with a wife and son under 16 and a daughter. The children were apparently Henry, who died in Tennessee without issue, and Mary, who married Jacob Shanks in 1817 in Tennessee. In records from the Lutheran Archives in Gettysburg, Pennsylvania, came the following record: St. Peter’s Lutheran Church (rocky Hill), Eisenberg and wife Elizabeth. He does not appear in the 1800 census records. Until the above record was found and the research done on the Tennessee Isenbergs, only to find their Nicholas whose wife’s name was Elizabeth, were we able to definitely say who this Nicholas was. This was further established when his son Jacob’s hymn book, recording himself and his children, came to light, containing his birth state as Maryland. This Nicholas and his wife Elizabeth apparently left Maryland sometime after 1792 and started west through Virginia, finally settling in Tennessee where they lived form about 1803 until their deaths. Their records are found in the Nicholas Isenberg of Tennessee chapter. Sometime after 1790 Gabriel remarried, his second wife’s name being Margaret. He also moved from the stone house in Bear Garden to the home nearer to the present McKinstrey Mill, which was sold after his death to Peter Saum. We have no record of this marriage, which was probably performed in Berks County, Pennsylvania, where a license was not required at the time. For several reasons we believe this Margaret to be the wife of the Simon Eisenberg of Berks County records. The main reason being that in our 1900 book there is a Peter Isenberg listed as a brother of the other Isenberg men who came back to Pennsylvania after Gabriel’s death. In fact, this Peter would be a nephew of Gabriel, Sr. if his father was Simon Isenberg who we think was a brother of Gabriel, Sr. He would also be a step son if his mother was Margaret, who married Gabriel, Sr. as a second wife. Also. Peter’s age in the 1800 census is with the records of Margaret Isenberg and Catherine Smouse – all listed as heads of the house. Both Gabriel Eisenberg and Henry Smouse (Heinrich Schmaus) had died before the census was taken. This seems to indicate the closeness of Peter to Margaret as his mother and to Catharine as his mother-in-law. All of the above 1800 census records listed no other free persons or slaves. 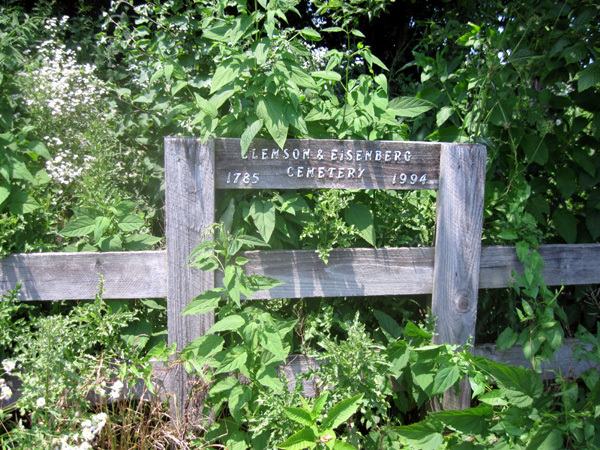 The Isenberg name is spelled in various ways- Isenberrier, Isenberg, Isenburg, Isenberier, Eisenberger. It is interesting to note that Catharine Smouse is listed in the 1800 census as being the head of the house and having one other female with her. That was probably Salome Smouse who did not marry. The other three Smouse girls had married Isenberg men and Henry, the father, had died. Since we have endeavored to fill in the names of the children in the families of the sons of Gabriel Eisenberg, Sr., we will record what we have of the daughters of the family. The Mary Isenberg Worman family is listed in the 1790 census. Her husband was Jacob Worman. The children are listed as 2 males over 16, 3 under 16, and 4 females. The two older boys were Noah and Conrad. Jacob Worman left no will, but the administrators of his estate were Conrad Worman and Matthew Scecht. Mary Worman’s account was file don January 10, 1810. This is taken from the records in the Frederick Court House, Frederick, Maryland. Anna Philipina Isenberg Shively (husband’s first name unknown) is listed in our first book as having the following children: Daniel, Henry, James, Mrs. Wolheater, and Mrs. Forest. Of Catharine Isenberg Truby/Truvey we have no record except to know that her husband’s first name was Jacob. There is one more record to be noted. Catharine Isenberg Hostler, whose husband was John Hostler, had a daughter Eve born 1801. This Catharine we believe to be the daughter of John George Isenberg and his wife Eve (John being the oldest of Gabriel’s children). In January, 1801 Gabriel Sr. died. He was taken back to Bear Garden and buried there in the little cemetery beside Maria Eva. About this same time Heinrich Schmauz (Henry Smouse), father of the three girls who married Isenberg men, also died and was buried not far from where Gabriel and Maria Eva were buried. “Frederick County, February 6, 1801 there came Nicholas Isonburgh, acting executor of Gabriel Isenburgh, Deceased , and made oath on the Holy Evangels of Almighty God that the foregoing instrument of writing is the true and whole will and testament of Gabriel Isenburgh late of Frederic County Deceased that hath come to his hand and possession and that he doth not know of any other. “Frederick County, February 6, 1801. There came Yort Cover one of the subscribing witnesses to the aforegoing will and testament of Gabriel Isenburgh late of Frederick County Deceased and made oath on the Holy Evangels of Almighty God that he did see the Testator therein named sign and seal this will and Testament that at the time of his so doing he was to the best of his apprehension of sound and disposing mind, memory, and understanding, that he subscribed his name as a witness to this will in the presence and at the request of the Testator and that he did also see Nicholas Umstead and John Justice the other two subscribing witnesses sign their names as witnesses to said will in the presence of the testator and all in the presence of each other. Since Jacob Worman had renounced his right as an executor of Gabriel’s will, the probating and settlement of the estate were left to Nicholas Isenberg, Gabriel’s son, as the other executor named in the will. IN 1802 a group of men including some of the Isenberg family journeyed from Maryland up into Pennsylvania by way of the stage coach route to Harrisburg, Pennsylvania, and then on up to Huntingdon County, Pennsylvania, to see about land that was for sale. We do not know why they wanted to leave Maryland. Some of the Isenbergs, Nicholas, Enoch, and John (Gabriel Isenberg, Jr.’s son) made plans to buy land in the area of Alexandria, Huntingdon County. Mr. Shively, husband of Philippina Isenberg, found work at the furnace in Rock Hill, now Orbinsonia – and stayed. Rock Hill was the first place west of the Susquehanna River to manufacture iron. The rest of the Isenbergs returned to their homes in Maryland. Then in 1804 those of the Isenberg family still living in Maryland, with the exception of Peter and Margaret Smouse Isenberg, Anna Isenberg Worman, and Susanna Isenberg Zollman, moved to Huntingdon County, Pennsylvania. 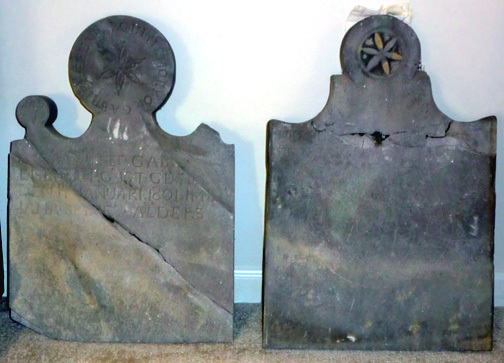 Current Notes: The original stones removed from the Clemson Isenberg Cemetery by Don Berkebile were auctioned at his estate sale. We were able to buy three of them. Gabriel’s, Eve’s and one we believe to be Eve’s fathers’ stone (Johann Swedner). There were others at the sale but we were unable to identify or secure them. Because Don had frequently replaced old stones with new ones in other family cemeteries he cared for, they may not have been Isenberg stones, but stones from his Father’s family.